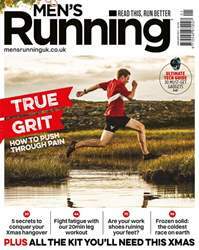 Digital Subscriptions > Men's Running > Jan-17 > MAN DOWN! There are days when the wind unexpectedly fills your sails. I wasn’t really hoping for much from the run. I had to squeeze it into a 90-minute slot between getting home from work and collecting my daughter from a school event. As I stood and shivered on my doorstep waiting for my watch to decide where it was, I fretted about the clothes I was wearing, my recent hamstring injury and whether I should go for a run at all.